Red Sails in the Sunset is the fifth studio album by Australian group Midnight Oil which was released in October 1984 under the Columbia Records label. It was recorded and produced in Tokyo, Japan and is significant for becoming their first No. 1 album in Australia – it also entered the United States Billboard 200. The cover image, by Japanese artist Tsunehisa Kimura, depicts Sydney Harbour after a hypothetical nuclear strike. Some of its tracks were performed live in January 1985 at a Sydney Harbour Goat Island concert to celebrate radio station Triple J's 10th birthday, which was simulcast on ABC Television and subsequently re-broadcast on their then-Tuesday night music program Rock Arena. In 2004 the film footage later became part of a DVD album, Best of Both Worlds. Red Sails in the Sunset contains the only Midnight Oil tracks with lead vocals provided by their drummer Rob Hirst, "When the Generals Talk" and "Kosciusko". The album spawned two singles, "When the Generals Talk" and "Best of Both Worlds" but neither appeared on the Australian singles chart. 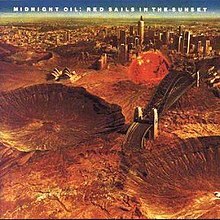 Midnight Oil released Red Sails in the Sunset in October 1984. It was recorded in June to August in Japan, and was produced by Nick Launay, who had worked on their breakthrough album, 10, 9, 8, 7, 6, 5, 4, 3, 2, 1 (1982). Columbia asked the band to return to the studio and record a more commercial single that could chart in America, but the band refused. Drummer Rob Hirst said that the band told Columbia to take it or leave it, and Columbia released the album as-is. It peaked at No. 1 for four weeks on the Australian charts, and charted on the Billboard 200. Singles from the album were also released in the United States and United Kingdom but had no chart success. Whilst the album showed an over-reliance on technical wizardry, their lyrical stance was positive. The band continued to expand their sound and explore themes of politics, consumerism, militarism, the threat of nuclear war and environmental issues. The album cover by Japanese artist Tsunehisa Kimura featured a photomontage of Sydney – both city and harbour – cratered and devastated after a hypothetical nuclear attack. Live concert footage of "Short Memory" was used in the Australian independent anti-nuclear war movie One Night Stand. A promotional video for "Best of Both Worlds" received airplay worldwide on cable music TV station MTV. In January 1985, Midnight Oil performed Oils on the Water, a concert on Goat Island in Port Jackson to celebrate Triple J's tenth birthday, before a select audience of fans who had won tickets in a radio competition. The concert was filmed, simulcast on ABC-TV and Triple J, and released on video, which was remastered for their 2004 Best of Both Worlds DVD. AllMusic's William Ruhlmann found that group were "ambitiously taking on a variety of lyrical causes in a variety of musical styles" and the album's "martial rhythms, chanted vocals, and guitar textures, served as a jumping-off place". However Garrett's vocals showed an "unrelentingly judgmental tone ... sung with dead seriousness ... tended to douse the album's potential enjoyment". Rolling Stone's Don Shewey felt their music "combines the postpunk abrasiveness of the Clash and Gang of Four with the Kinks' music-hall variety and the pure pop of groups like Cheap Trick". Shewey wrote that their "references to local politics and history that stud the group's songs and account in large part for its huge appeal down under may seem exotic or puzzling to Americans". Bill Wolfe of Spin wrote, "Midnight Oil is not only the Australian band of the '80s, it may very well be the band of the '80s. Period." ^ a b c d e McFarlane, Ian (1999). "Encyclopedia entry for 'Midnight Oil'". Encyclopedia of Australian Rock and Pop. Allen & Unwin. ISBN 1-86448-768-2. Retrieved 20 October 2008. ^ Holmgren, Magnus; Stenerlöv, Carl-Johan. "Midnight Oil". Australian Rock Database. Passagen.se (Magnus Holmgren). Archived from the original on 27 September 2012. Retrieved 12 February 2014. ^ Wolfe, Bill (August 1985). "Bubblin' Crude". Spin. 1 (4): 18–19. ^ a b "Midnight Oil – Charts & Awards – Billboard Albums". allmusic. Retrieved 21 October 2008. ^ Ed Nimmervoll (ed.). "Midnight Oil". Howlspace. Archived from the original on 27 July 2012. Retrieved 22 January 2014. ^ "Memorable TV – L to M". Memorable TV. Archived from the original on 17 October 2008. Retrieved 22 October 2008. ^ a b c Ruhlmann, William. "Red Sails in the Sunset – Midnight Oil". AllMusic. Rovi Corporation. Retrieved 30 April 2012. ^ a b c Shewey, Don (29 August 1985). "Midnight Oil – Red Sails in the Sunset". Rolling Stone (455). Jann Wenner. Archived from the original on 25 July 2008. Retrieved 30 April 2012. ^ a b Wolfe, Bill (August 1985). "Spins". Spin. 1 (4): 29. ^ Kent, David (1993). Australian Chart Book 1970–1992. St Ives, NSW: Australian Chart Book. ISBN 0-646-11917-6. NOTE: Used for Australian Singles and Albums charting from 1970 until ARIA created their own charts in mid-1988. ^ "Charts.org.nz – Midnight Oil – Red Sails in the Sunset". Hung Medien. Retrieved 30 November 2018. ^ "ARIA Charts – Accreditations – 2014 Albums". Australian Recording Industry Association. Retrieved 31 December 2014. ^ "Red Sails in the Sunset – Midnight Oil". Allmusic. Rovi Corporation. Retrieved 30 April 2012. This page was last edited on 20 December 2018, at 11:56 (UTC).